23. Skip Schumaker: See #24, minus the switch hitting. 22. 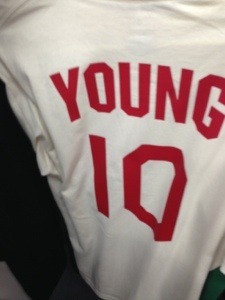 Michael Young: The classiest of the classy. 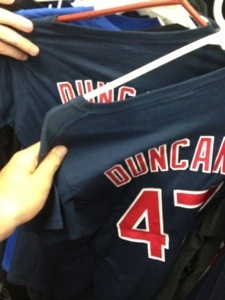 I was hoping it’d be Delmon, but this’ll do. 21. 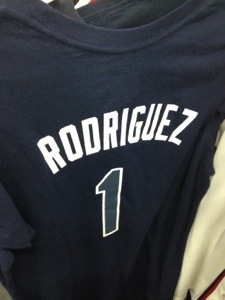 Sean Rodriguez: Remember when he was really good for like three weeks last year? Neither does anyone. 20. 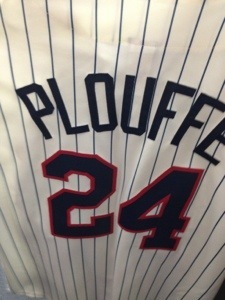 Trevor Plouffe: This was an authentic jersey. Such a waste. 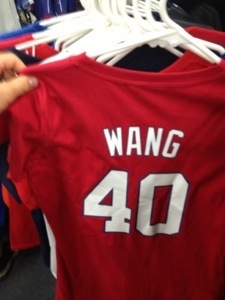 Wouldn’t it be cheaper to put “Mauer” and the number “7” anyway? 19. Casper Wells: I don’t even wanna talk about it. 18. Craig Stammen: The essential ROOGY. 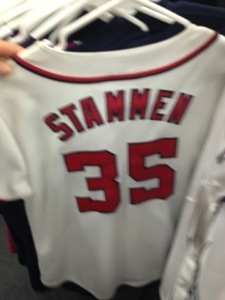 Stammen is semi-fun to watch but is this really the reliever jersey you want from the Nationals? 17. 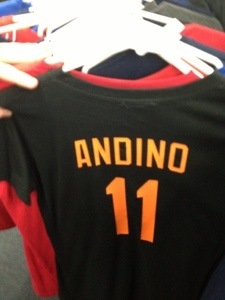 Robert Andino: Yeah, he sent them to the playoffs. 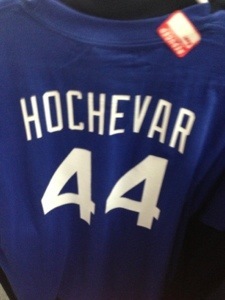 But since he’s been traded to Seattle, he’s done absolutely nothing. 16. 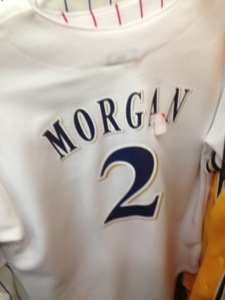 Nyjer Morgan: Nyjer Morgan was absolutely crazy and the fans loved him or hated him. 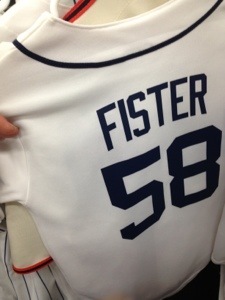 Just seems dangerous to wear his jersey. 15. Chien-Ming Wang: The Nationals were excited to acquire him in 2011, but he only managed to throw 94.2 innings over two years with the team. 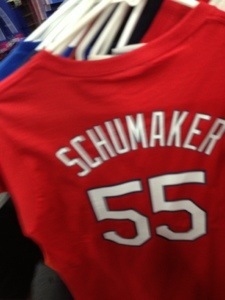 He gave up 59 runs in that brief stint with the Nats. 14. 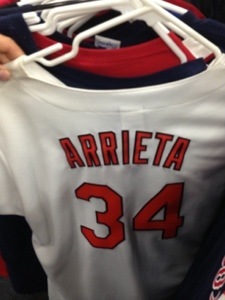 Jake Arrieta: The Cubs just acquired Arrieta last week, so maybe this local Chicago shop just wanted any Arrieta jersey in as soon as possible? Jake Arrieta is 27 years old and has a career ERA of 5.46 over 358 innings. 13. 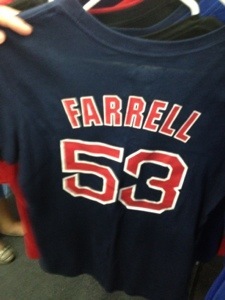 John Farrell: I have honestly never seen a manager’s jersey or shirsey being sold or worn anywhere by anyone. So weird. 12. 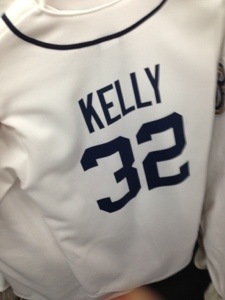 Don Kelly: One of Jim Leyland’s favorites, Kelly is the essential fourth outfielder. 11. 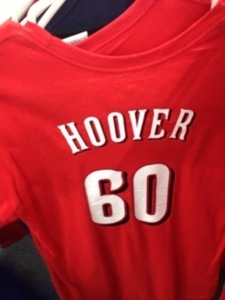 J.J. Hoover: It’s very very rare that you see the jersey/shirsey of a relatively new middle reliever. Because duh. 10. 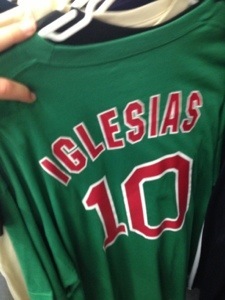 Jose Iglesias: It’s green. 9. 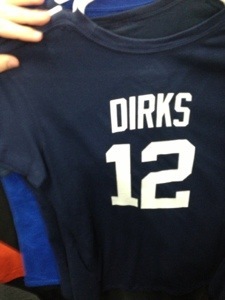 Andy Dirks: Because having Don Kelly wasn’t enough, HERE’S ANDY DERPS. 8. 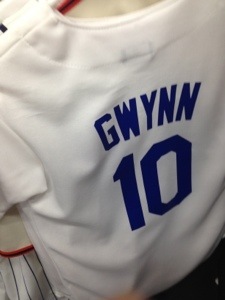 Tony Gwynn Jr.: I suppose the name recognition here helps, but he has been a remarkably insignificant major leaguer. 7. 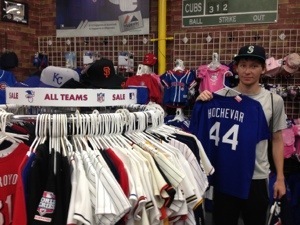 Luke Hochevar: The Royals nailed this pick in 2006, taking Hochevar number one overall one pick before mega-bust Greg Reynolds (and Evan Longoria, Clayton Kershaw, Max Scherzer…). 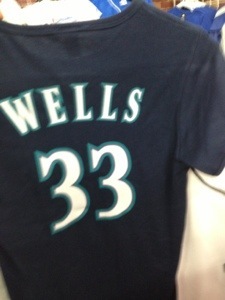 I bought it. It’s glorious. 6. 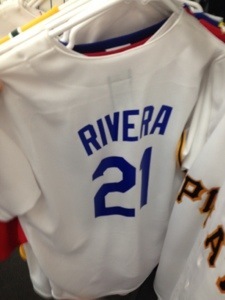 Juan Rivera: When is the last time Juan Rivera did something interesting on a major league baseball field? 4. 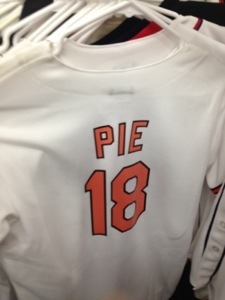 Felix Pie: He will always have a special place in the hearts of Cubs and Orioles fans as that guy who was named Pie. 3. Shelley Duncan: THERE WERE MULTIPLE SHELLEY DUNCAN SHIRTS. EXPLAIN THAT. 2. Michael Gonzalez: Jake thought it was Gio Gonzalez at first glance, but I quickly corrected him and oh my god how is this even a thing? 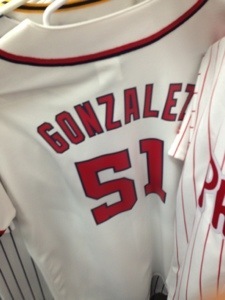 Mike Gonzalez is a left handed reliever that spent ONE season with the Nationals. I’m so confused. 1. 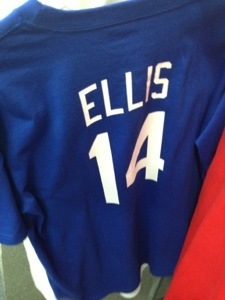 Mark Ellis: All I want for every gift giving holiday ever is a Mark Ellis shirsey because I care about excitement and personality. Unreal. 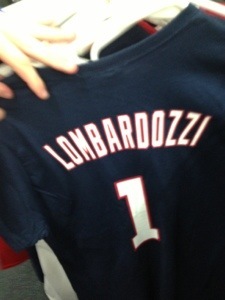 Here’s to the greatest clearance section of all time. This entry was posted in The Trip and tagged bad baseball jerseys, Chicago Cubs, clearance section, felix pie, mark ellis, shirseys, sportsworld chicago, weirdest baseball jerseys, wrigley field. 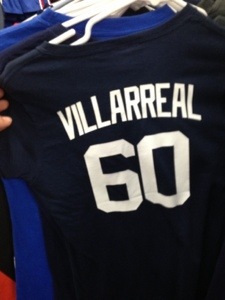 I don’t understand life, or why all those reliever shirseys exist. Neither do we, but we are sure as hell happy they exist. Sorry I missed this posting before I could have wired you some money to make some pivotal purchases for me. What a treasure trove!